tom fruin has unveiled his newest kaleidoscopic structural installation ‘watertower’ as the premiere work completed in the united states for his series ‘icon‘. the brooklyn artist has built a 25 by 10 foot tall water tank formed from nearly 1,000 colorful salvaged plexiglass pieces gathered from all over NYC. the work has been constructed atop building 20 jay street, near the east river waterfront in brooklyn. the glittering sculpture is illuminated by natural light during the day, while from sunset to sunrise an ardunio-controlled light show, designed by ryan holsopple, is conducted inside the work. 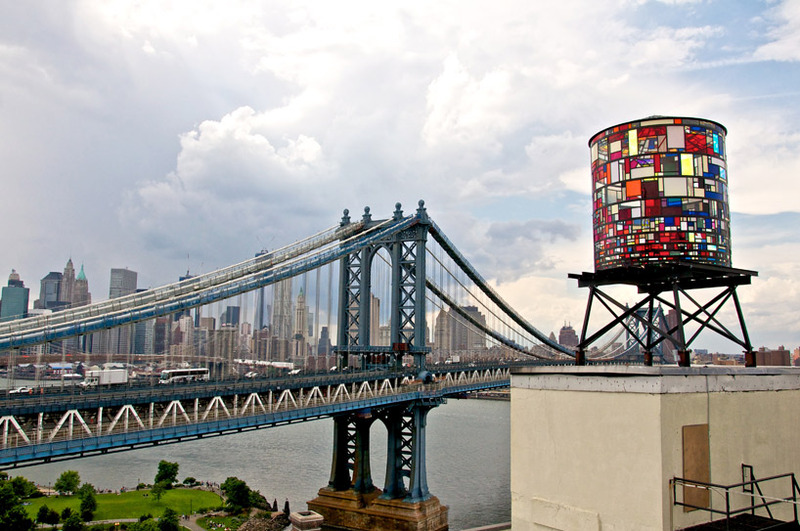 ‘watertower’ is visible to any person with a clear view of the dumbo, brooklyn, NYC skyline. the illuminated, colored glass work will be on show from june 7th, 2012, remaining on exhibition until the following june.